At Zion Lutheran School we teach the message of salvation in Jesus Christ to children in our community within an environment of high academic standards, equipping them to serve Church and society. Zion offers education for families seeking educational atmosphere of excellence and Christ-centered education. Students will grow in their faith, receive dynamic instruction, and develop their God-given talents. Zion Lutheran School is here to partner with parents for the purpose of equipping students to make a difference in the world in which we live. Our school is committed to providing students with an environment where they learn about Christ’s saving promise and experience the love of Jesus Christ. It is our sincere desire to make a quality Christian education accessible to those families who support our values, and who seek partnership with our school. Zion Lutheran School distributes tuition assistance to families based upon availability of funds and need for those funds. All tuition assistance applications are handled with strict confidence. Zion Lutheran uses an accelerated curriculum that is accepted by the state of Indiana and approved by the Lutheran Schools of Indiana. Students are taught above the State Standards and Guidelines of the College and Career Ready Standards for the State of Indiana. Zion Lutheran is accredited by the National Lutheran School Accreditation. This is an accepted accreditation by the State of Indiana. Yearly upgrades and benchmarks are met and exceeded to maintain accreditation status. Find Out Why Zion is Great! Zion Lutheran School provides the secure, nurturing, and challenging environment that students need to learn and develop. Our Christian-based programs strive to instill a life-long love of learning and a quest for knowledge among elementary school students. 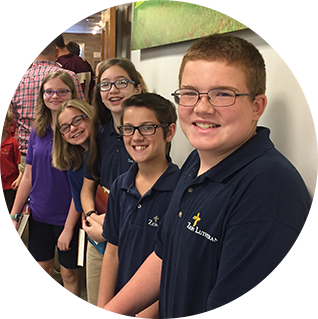 Zion Lutheran middle school balances academics with daily religious studies to build the moral character that these students will need to take their place as community leaders. Technology and the use of iPads are woven throughout the curriculum and instruction. 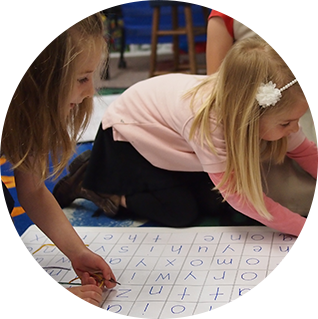 Kindergarten offers an academic transition from preschool into the elementary educational path. Students continue to learn with hands-on activities, literacy centers, individual and group instruction. Students practice what they learn to build a strong foundation for the future. Pre-K is open to children who are 4 years or age by August 1st of the enrolling school year. Preschool 3’s is open to children who are 3 years of age by August 1st of the enrolling school year. We invite children from birth to age 3 to join us for a Jesus and Me (JAM) Session on Friday mornings at Zion. Class is offered from 9:30am–10:30am during the school year. This free class is offered for a caregiver to come in with their child and enjoy the opportunity to play with others, learn a new story, and experience a little bit of preschool.